What can we say about the Queen that we haven’t said already? She is undoubutedly the Queen. 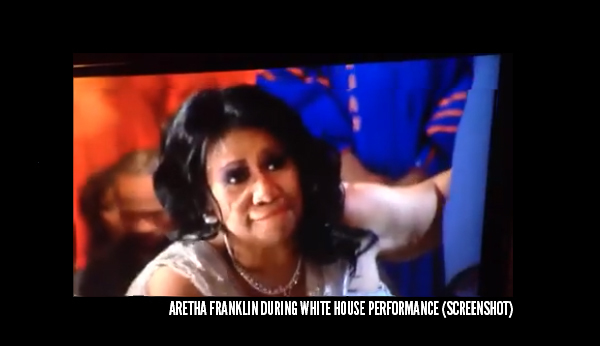 Lady Soul Aretha Franklin was one of the special guests on program at a recent White House gospel celebration attended by U.S. President Barack Obama and First Lady Michelle Obama. On the menu was traditional gospel music, the stuff that Franklin was raised on and highly used in her own solo career as a soul singer. Franklin was joined with other luminaries like Lyle Lovett, T Bone Burnett and Darlene Love, among others. 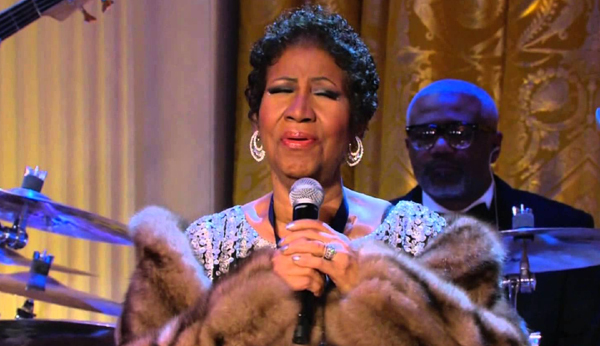 During her tribute to days gone by with a soul-stirring rendering of the hymn “Precious Memories,” Franklin decided to kneel down for the Father. But she needed a little help. Literally. Watch the full clip. Towards the end of the performance at is where she make her kneel. Her accompanying guests, quartet singers Doug and Melvin Williams (of the Williams Brothers), had to help her up. But it wasn’t easy. No word if Franklin received any emergency assistance, but we’re hoping that everything is alright. And we’re also praying that “We Fall Down” won’t be sung by the Queen of Soul in the near future. Franklin’s last appearance at the White House was last year where she paid tribute to soul music. After that 2014 performance, a little controversy appeared on Queerty and in several news columns regarding potential “shade” given to Patti LaBelle, who was also present. Franklin dismissed the idea as being frivolous. Not the first time that idea has been entertained. Back in April, Queen ReRe dropped a whopping $10 million lawsuit on the humor site News Nerd for posting a fake story involving her and LaBelle.